During the regime of dictator Augusto Pinochet (1973) this ship was used as prison and floating torture place of the Chilean Navy. At least hundred people were systematically tortured and raped. 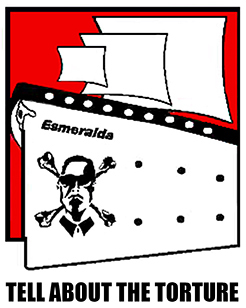 Today the Esmeralda is a training ship of the Chilean Navy and sails around the world and has also an economic trade mission where issues such as human rights violations on this ship is forbidden to speak about. In coordination with the Mapuche People and the Chilean community living in the Netherlands there will be a vigil taking place in memory of as-well Mapuche and Chilean victims during the Pinochet dictatorship. During the vigil there will be speakers, but also Artists, Poets, Chilean/Mapuche musicians and politicians. In front of the “Saint Tropez” company.